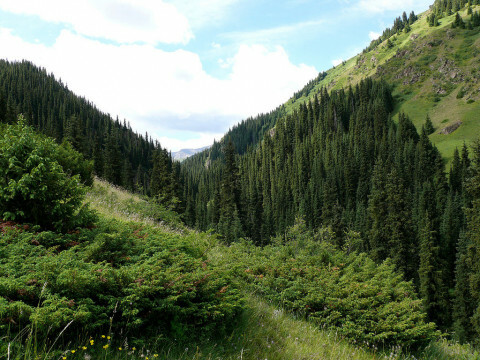 The cost of staying in the Ile-Alatau State National Park of Almaty has been almost halved. The city’s specialized environmental prosecutor’s office revealed an illegal overpricing for visitors, the correspondent of the business information center Kapital.kz reports with reference to the press service of the office. «The tax code provides for the collection of visitors 0.1 MCI (252 tenge) at environmental checkpoints. By order of the management of the National Park dated June 1, 2018, tariffs were approved for the use of tourist routes (paths, viewing platforms, camp glades) in the amount of 200 tenge per person, where there are restrictions on the number of visitors and a seasonal period (June-October). Thus, the National Park year-round, without limitation, was paid illegally from all visitors 452 tenge, while not all persons used tourist routes, limited to visiting cafes and restaurants», - explained in the prosecutor's office. The park administration also did not create conditions for registering visitors along tourist routes. «The protest of the Specialized Environmental Prosecutor of Almaty dated January 10, 2019 canceled the above order, the cost of staying in the National Park was reduced from 452 to 252 tenge», - told the press service. The management of the National Park should decide on the system of differentiated fees for visiting the park.